Free Marmalade, Free Honey, And Free Candy! We never tire of touting how wonderful this gift is! 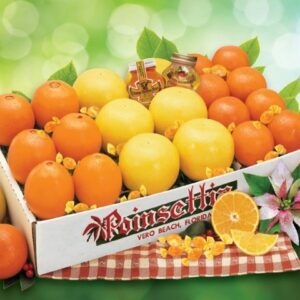 It’s three of our all-time favorite varieties including classic Navel Oranges, delicious Tangelos, and famous Indian River Ruby Red Grapefruit, plus FREE Orange Blossom Honey, FREE Marmalade, and FREE Candies. With so many flavors to enjoy, this gift is always a big hit during the holidays.